Through the years, I’ve prayed about many things for my children. They were chronically sick for a long time and I prayed often for their health and healing. I’ve also prayed for their behavior, their friendships with other children, their education, for our relationship as a family, and even for their future as adults. Why pray about the heart? Because the heart is the core of who we are. When the Bible talks about the human heart, it doesn’t mean our real heart— the one that beats in our chest. It also isn’t referring to the heart shaped candies with sweet messages printed out them we like to eat on Valentine’s Day. The Bible uses the term ‘heart’ to mean our inner self, who we are as a person. Our real self. This inner self includes our thoughts, desires, feelings, personality, motives, and the decisions we make. “As in water face reflects face, so the heart of man reflects the man” (Proverbs 27:19). Because we are sinners, our hearts are prone to sin. What we need is a new heart. God promised this in Ezekiel: “And I will give them one heart, and a new spirit I will put within them. I will remove the heart of stone from their flesh and give them a heart of flesh, that they may walk in my statutes and keep my rules and obey them. And they shall be my people, and I will be their God” (Ezekiel 11:19-20). This is what the Spirit does in us when he awakens our dead heart to life: he gives us a new heart, a heart capable of responding to God in faith and living out that faith in love and obedience. What our children need most is a new heart—it really is the heart of the matter. They need the Spirit to bring them from death to life. They need the Spirit to work in them, transforming them into the likeness of Christ. 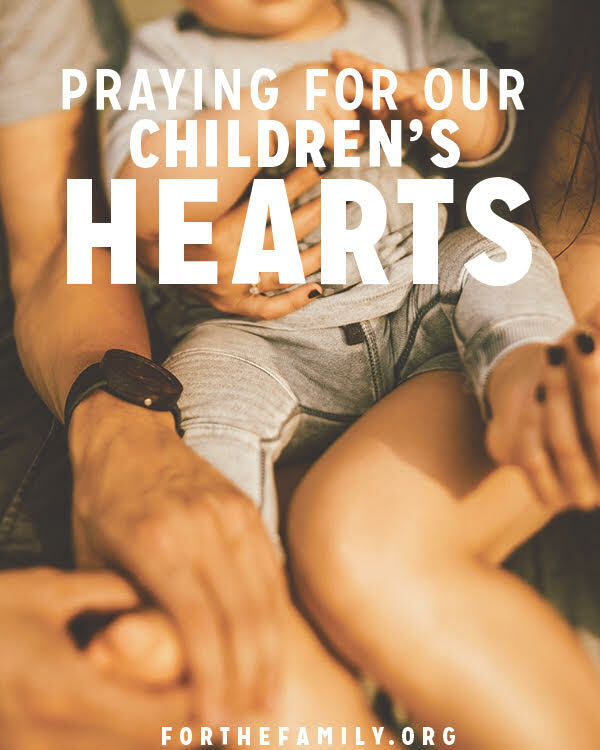 So even as we pray about other things for our children—friendships, behavior, school, etc.—those things are ultimately about the heart as well. For as God transforms and changes their hearts through the work of the Spirit, it changes how they choose friendships, their outward behavior, and their attitude toward school. I’ve learned this lesson about praying for heart matters from the Apostle Paul. He wrote letters to various churches and his letters take up a good portion of the New Testament. Some of these churches were struggling with trials, hardships, and persecution. In those letters, he mentions the prayers he is praying for them. The prayers he prayed for them were not focused on the temporary but on the eternal. He prayed for their hearts, for God’s work in them, for their growth in faith. He prayed for the work of the Kingdom and the spread of the gospel through them. He prayed for their spiritual strength and encouraged them with the hope they had in Christ. When I consider praying for the hearts of my children, Paul’s prayers are an excellent model to follow. I have used his prayers as inspiration for my own and sometimes have even prayed his exact words for my children. All that our children are flows from their heart, so whatever it is we pray for them, may we never fail to pray for God’s work in their hearts.